I must confess that I do not always understand the choices of the lectionary authors. Take this summer (year B) for instance. We are served the Bread of Life for five straight weeks (July 26 -- August 23). I'm feeling bloated already! As one who usually preaches the gospel reading, I'm already wondering how to slice this loaf in appetizing ways five weeks in a row. It is hard to miss the Eucharistic symbolism in John 6. "Then Jesus took the loaves, and when he had given thanks, he distributed them..." (John 6:11). John is the only gospel that does not have a story of the Last Supper and Jesus' institution of the Sacrament. In his commentary on John, Raymond Brown explains, "And so it is that, while the Synoptic Gospels record the institution of the Eucharist, it is John who explains what the Eucharist does for the Christian." So what does the Eucharist do for Christians? This summer, I wonder if in addition to exegeting John each Sunday, we also exegete the Sacrament? Why not present a series of sermons on the meaning of Holy Communion for our congregations? I am betting your congregation will find it satisfying. Whenever I teach a first communion class for fifth graders, it is often the parents who express the most appreciation. They are grateful because the class opens up for them a wider depth of meaning for the Sacrament, things they had never known or had forgotten. Communion is like a diamond with many facets, which is reflected in part by the many names we call it: Eucharist, Lord's Supper, Holy Communion, Mass. It is good to take some time to explore them all, or at least more than the one or two we remember from our Confirmation days. Let me explore one of those facets with you. Gladys was a widow in a church I was the pastor. Her husband, Conrad, had been a pastor whom she had served faithfully alongside of for many years. One day in Bible study, Gladys shared with me her favorite part of the worship service. It was the ending of the Eucharistic Preface where the church on earth is joined with the hosts of heaven in praising God with an unending hymn: "Holy, holy, holy Lord." She knew in that moment that her beloved Conrad was with her and that somehow this meal joined together "things in heaven and things on earth." Communion opened up a window into eternity for her, a connection to the "cloud of witnesses." Gladys was my teacher that day. I cannot think about Holy Communion now without thinking about her and the communion of saints. These are the kind of stories we can share to help broaden our congregation's understanding of this gift of grace. First, tell your own stories. In a five week series, though, you may need some help from others who have thought deeply about Holy Communion. There are several good books, beginning with Alvin Rogness' Table of the Lord: Holy Communion in the Life of the Church (Augsburg, 1982). Martin Marty has a small commentary called The Lord's Supper (Augsburg, 1997). 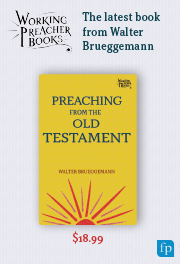 More recently are the excellent books by Samuel Torvend, Daily Bread Holy Meal: Opening the Gifts of Holy Communion (Augsburg 2004), and Louis Accola, Given For You: Reflections on the Meaning of the Lord's Supper (Augsburg, 2007). Accola's book in particular was written to be the basis for a sermon series on the meaning of the Lord's Supper. Torvend's book is especially good at connecting Communion with justice issues and creation care. In their book, Creative Preaching On the Sacraments (Discipleship Resources, 2001) authors Craig Satterlee and Lester Ruth argue that in our post-modern context people hunger not only to understand but also to experience the Sacraments. If your church does not celebrate weekly communion, use this series as a time to experience what that might be like. Invite members of your church to share in worship what Holy Communion means to them. During the series, replace the Creed with Luther's explanation of Holy Communion from the Small Catechism. It will bring back many memories from your older members who had to memorize it in their youth. Are you getting hungry yet? My mouth is starting to water thinking of possibilities of serving the Bread of Life this summer. Your congregation will thank you for this delicious feast.